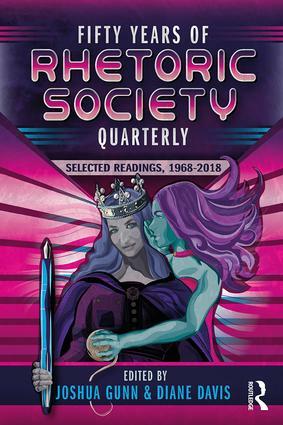 Fifty Years of Rhetoric Society Quarterly: Selected Readings, 1968-2018 celebrates the semicentennial of Rhetoric Society Quarterly, bringing together the most influential essays included in the journal over the past fifty years. Assessed by members of the Rhetoric Society of America, this collection provides advanced undergraduate and graduate students with a balanced perspective on rhetorical theory and practice from scholars in both communication studies and rhetoric and writing studies. The volume covers a range of themes, from the history of rhetorical studies, writing and speaking pedagogy, and feminism, to the work of Kenneth Burke, the rhetoric of science, and rhetorical agency. 7. "Rhetorical Criticism of Public Discourse on the Internet:　Theoretical Implications" (Warnick). 10. Forum Discussion: "How Ought We to Understand the Concept of Rhetorical Agency? Report from ARS [Alliance of Rhetorical Societies]" (Geisler). Joshua Gunn is Associate Professor of Communication Studies and Affiliate Faculty with the Department of Rhetoric & Writing at the University of Texas at Austin. He's published a scholarly monograph, a public speaking textbook, and over 75 essays and chapters on the topics of rhetoric, media, and cultural studies. Diane Davis is Professor and Chair of the Department of Rhetoric and Writing and Affiliate Faculty with Communication Studies at the University of Texas at Austin. Her work is situated at the intersection of rhetorical theory and continental philosophy.